Come and immerse yourself in the spectacular town of Tepoztlán. Located in Mexico's Central Highlands, Tepoztlán is an inspiring place rich in beauty and tradition. Daily memoir writing workshops will be complemented by free time to write, relax or explore. Optional excursions to the town's famously colourful markets and historic buildings and/or a hike to the pyramid in the surrounding mountains are also on offer. Evenings will be celebrated with gourmet meals, stories, a superb presentation on Mexican art, and an optional night of dancing. The setting for this retreat is Casa Temictli, famous for its architectural beauty, gastronomical wonders, luxuriant art gardens, and warm, welcoming hosts. This year, we will be offering two retreats: one for beginning writers and another for people with some writing experience. Each of the writing workshops will be limited to 7 participants. Couples are welcome and spouses need not participate in the writing workshops. NEW RETREAT DATES WILL BE ANNOUNCED SHORTLY. TO RECEIVE NOTIFICATION, please join the mailing list below. Each day will begin with a leisurely buffet breakfast on the terrace, followed by a 3- to 4-hour writing workshop with Alison Wearing. In addition to offering essential tools and guidance through obstacles and questions, these workshop sessions will give participants an opportunity to share and receive valuable feedback on their writing. People may be at different stages of the writing process and the sessions will be sculpted to ensure that every person receives tailored attention within the workshop, in addition to a one-hour private session with Alison at some point during the week. A simple application process will also aid in the curation of a mutually inspiring writing environment. For a detailed description of a memoir writing workshop and testimonials from similar workshops, please visit the memoir workshop page. Following the midday meal, people are welcome to do as they please! In the heat of the afternoon, rest and relaxation may be in order, a swim in the pool, a visit to the local bookstore/garden café, or a bit of writing time in a shady spot in the garden or living room. (For a full tour of Casa Temictli, please see the video at the bottom of this page.) Private or semi-private Spanish lessons can also be arranged at additional cost. Retreats begin in the afternoon of the arrival day (Sunday) and end after breakfast on the following Sunday. Exceptional gourmet meals will be prepared daily by chef and food artist Janet Dawson, one of our hosts at Casa Temictli. Janet Dawson, chef extraordinaire, food artist and one of our hosts. Vegetarian options are available; limited special diet accommodations can be made. * Beyond 1 complimentary drink, wine/beer will be sold by the bottle at cost. People are also welcome to buy their own alcohol at village shops and supermarkets. There is no way of overstating this: the food at Casa Temictli is EXQUISITE. This is food as an art form. Participants fly to Mexico City International Airport (MEX). Tepoztlán is a 90-minute ride from Mexico City airport (see Google map) and airport transfer to/from Casa Temictli can be arranged for a modest cost. There are four bedrooms in Casa Temictli (see photos below, plus the video tour at the bottom of this page), the home of our hosts, Janet Dawson and Doug Clark, and the setting of the retreat. There is also overflow accommodation at a beautiful boutique hotel a 3-minute walk from Casa Temictli, as well as a BUDGET family-run hotel just around the corner. Regardless of your accommodation choice, all meals will be enjoyed together and EVERYONE is welcome to make use of all facilities at Casa Temictli, including the pool, wifi, grounds, writing tables. All rooms may be booked at a 'couple's rate' and shared with a spouse not taking the writing workshop. Please see PRICES below. 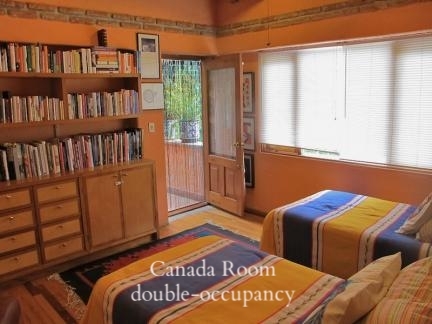 * The Canada Room can be booked as a TWIN (double-occupancy) accommodation, in which case the room will be shared and a roommate will be assigned, or as a private (single-occupancy, king bed) room. Please see PRICES below. 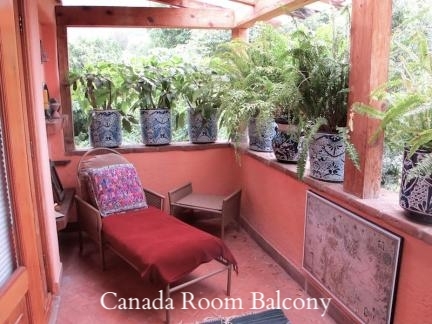 ** The Canada Room and the Mexico Room share one bathroom. Once the rooms at Casa Temictli are full, beautiful suites and deluxe rooms are available at a neighbouring boutique hotel just a 3-minute walk away. The suites have a private balcony or terrace, and all rooms have mountain views and access to all hotel facilities. 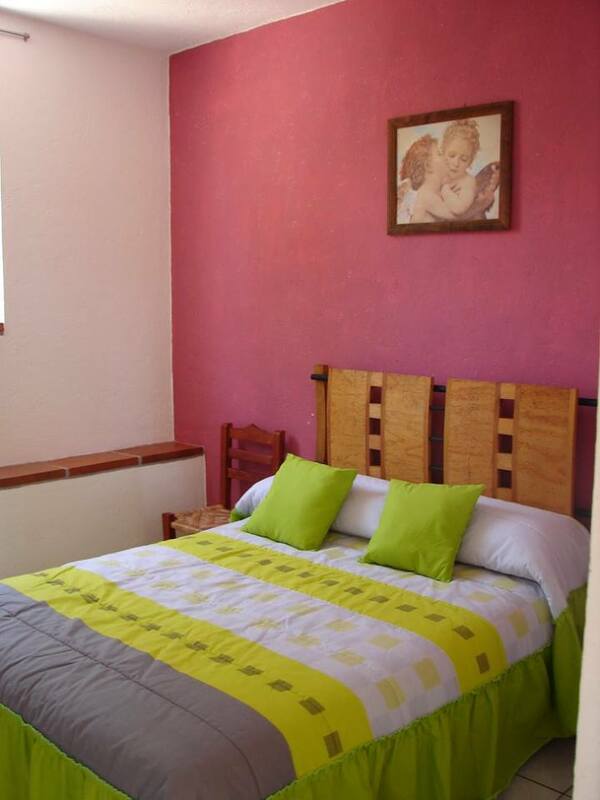 There is a lovely, simple, family-run hotel less than a 5-minute walk from Casa Temictli. In addition to bright, clean rooms, the hotel has a rooftop terrace with a breathtaking view of the mountains. Single- or double-occupancy (or couple) rates available. Includes accommodation, gourmet meals*, daily writing workshops, one 1-hour private session with Alison, all outings, use of all facilities at Casa Temictli, including wifi, pool, towels, garden, plus an exclusive in-house lecture/presentation on Mexican art. *All meals are for the 7-day retreat are included with the exception of two excursions to local restaurants. These outings are optional and a stay-home meal can be provided as an alternative. *COUPLES ARE WELCOME. For spouses not taking the writing workshop, please add CAD$950 to the single-occupancy rate. For spouses participating in the writing workshop, please add CAD$1950 to the single-occupancy rate. It was January of the year 2000, when the world was expected to fall into millennial chaos, but somehow didn't. I had hoped it would, or rather, I had hoped that some kind of shift would occur. Because I was looking for change, massive change. A rescue of sorts. One afternoon, in the middle of a freezing rain storm that had kept us housebound for days, I saw an ad for a house for rent in a legendary Mexican village with spectacular mountain views. I'd never been to Mexico before, knew nothing of its legends or its mountains, but on a whim—a desperate one—I called and booked the place for the following week. With my six-month-old slung to my hip, I set off. And within a day or two of arriving, I began to feel better than I had in months. The more I wandered Tepoztlán's cobblestone streets, inhaled its vistas and flowers, ate in its lively market, drank in its colour, warmth, blossoms and sacred natural surroundings, the more I wanted to live there, raise my son there. To make a long story short, that is eventually what happened. And although we are back in Canada now and happy to be here, Tepoztlán is still home to us in many ways. So it is with particular pleasure and heart that I now share with place with others. Thanks for your question! I'll get back to you as soon as I can.